Life is about taking leaps. Sometimes we’re ready to jump. Sometimes we’re just pretending to be ready. Sometimes we don’t even pretend. Eclipse 2017 has come and gone! When I wrote about it in EVERY SOUL A STAR, 2017 seemed so far away! I hope a lot of you got to see either a partial or total eclipse–we were in the mountains of North Carolina at a radio observatory–one thing that was really surprising that is how much cooler it got when the sun went away! Felt like it dropped thirty degrees! I’ll have to check to see if I wrote about the temp changing in the book! So that really struck me, and also how totally freaked out people must have been before eclipses were predicted in advance because it was really bizarre when the darkness crept in. Here’s a little video about the event at PARI. Thank you to everyone who has reached out about reading the book and traveling to the eclipse, that means SO much to me. LOVE these pictures from school eclipse trips (and two from my own) ! My twentieth book (The Candymakers and the Great Chocolate Chase) came out this year. That feels like a big milestone when I worked so hard and dreamed so long of just writing one good enough to get published. I’ve thought a lot about gratitude over the years (Oprah really had something with that gratitude journal idea, or at least that’s where I first heard of it.) If you start writing down four things at the end of each day that you’re grateful for, you’ll spend your whole day looking for wonder, I promise you, and you’ll almost always find more than four. If you’d like to order any personalized/signed books as gifts for the holidays (or anytime) you can do it through my local bookstore–I go in and sign them, they send them, someone reads them. Easy peasy! ps. Thank you anyone who has commented on previous blogs, and thank you for your patience in waiting for them to show up. pps: This was originally sent out to readers who signed up on the mailing list on wendymass.com, feel free to do that if you haven’t. Thanks! Thank you to everyone who helped land THE CANDYMAKERS AND THE GREAT CHOCOLATE CHASE on the New York Times Children’s bestseller list and the Indie Booksellers Children’s bestseller list on its first week out! I’d send you each a basket of candy if I could (although I’d probably eat it first)!! I hope everyone who submitted a suggestion for the book in previous blog comments realizes how awesome their ideas were, and a ton of them show up in the book–especially the suggestions for clever tag lines for a certain candy that won the contest in the first book. So I couldn’t have written this book without you. I hope you enjoy hitting the road in a tricked-out RV with your old friends Logan, Miles, Philip and Daisy, (and a few other surprise guests!). Hi All! This is the newsletter I sent out to anyone who signed up on the website to receive book news. It’s chock full of updates (Voyagers, the Candymakers sequel, Space Taxi and more). I’ll update the pages here on the website to include the new books very soon. Can’t seem to cut n paste it, but here’s the link. GRACEFUL and SPACE TAXI 3 hit the shelves!! Hi!! I’m excited to announce that GRACEFUL is out TODAY, April 28th!! This time it’s REALLY the last book in the Willow Falls series! THE LAST PRESENT is out in paperback today too, so it’s a great time to catch up on the series if you’re behind. On a personal note, these books have been a joy to write, and I can’t thank you enough for your support. I would LOVE to hear your thoughts on it, and I hope it wrapped up the way you’d have hoped (with a few surprises thrown in there!) I’m going to miss those characters! 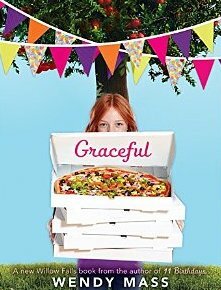 If you would like a personalized/signed copy of GRACEFUL (or any of the books) for yourself or a gift for a friend, feel free to contact my local bookstore to arrange—Sparta Books, 973-729-6200. The mysterious Angelina D’Angelo has left town to see the world. It’s now Grace’s turn to use her magic to protect the people of Willow Falls, and she’s up to the challenge. This is her destiny, after all. But destiny is a funny thing—it doesn’t always behave the way you’d expect it to. All your favorite characters are back and you get to glimpse their futures…even before they do! And the third book in the SPACE TAXI SERIES is out!!! Archie Morningstar’s dad drives a taxi through outer space. And with the help of a talking cat named Pockets, Archie and his dad help fight crime across the universe! In the third book in this early reader series, the three travel to a Medieval planet to rescue a princess who has three eyes, green hair, and an attitude! A special THANK YOU to everyone who suggested slogans for the harmonicandy in THE CANDYMAKERS AND THE GREAT CHOCOLATE CHASE. I used so many of them in the book! Also a lot of your ideas of new candies and stories about road trips also made it in! (keep those comin’ if ya got ’em!) More updates as I finish up! Hi all!! I’m still deep underground trying to meet my deadline for The Candymakers and the Great Chocolate Chase. Your suggestions for new candies and road trip ideas have been SOOOO HELPFUL!!!!! Thank you!!! For those of you who haven’t read the first one yet, spoilers ahead so may not want to read the rest of this post! For the others, here’s another chance to pitch in…Miles has to come up with an advertising slogan for the Harmonicandy, so I’ve been gathering a list of ideas. Things like: Harmonicandy, the musical treat! or The Harmonicandy, chew to the tune! You can see why i need help! I’d love to hear your ideas! I promised some news updates, and here ya go. This post used to be about problems getting some of the books from Amazon but that’s been worked out, so Thank you all for your support while you’re waiting for Graceful, and once i finish the Candymakers sequel I’ll do my best to catch up with posting your comments and answering questions. Thank you for your patience! I had a blast writing for younger readers this time around. 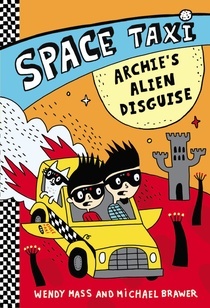 Space Taxi: Archie Takes Flight is the first in the series. The second, “Space Taxi: Water Planet Rescue,” will be out in September. Check out the awesome (and informative!) website our publisher is making for the series. They have lots of cool stuff planned in the coming months but you’ll be able to check out a preview now, focusing on the science behind the story. You can also read a sneak peek of the story!